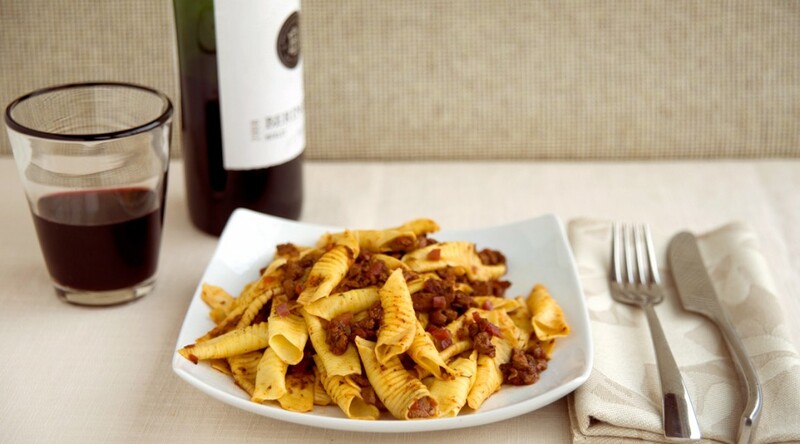 This simple, savory ragu combines my favorite elements of a classic Bolognese ragu (the milk and red wine) with my favorite elements of a southern Italian-style ragu (the spicy sausage and garlic). If you have a rind from a hunk of Parmigiano-Reggiano or Grana Padano on hand, throw it into the ragu pot to lend additional richness, then remove it before tossing with the pasta. Make the ragù: Place the olive oil, onion, garlic, and basil in a 10-inch sauté pan over medium-high heat. Cook 5 minutes, or until softened. Stir in the sausage and beef, and cook until browned all over, stirring often, about 10 minutes. Be sure to let the meat develop a deep brown color at this stage, or the ragu will taste flabby instead of rich. Add the wine and then, after 5 minutes, the broth, tomatoes, bay leaf, salt, and pepper. If you have a cheese rind, add it at this point and make sure it is fully submerged in the liquid. Make the pasta: Bring 5 quarts of water to a boil. Add the salt and the pasta, and cook until al dente; drain, reserving 2 cups of the pasta cooking water. Add the pasta to the sauce and sauté over high heat for 1 minute. Stir in the Parmigiano, and add some of the reserved pasta cooking water if needed to thin out the sauce. Adjust the seasoning and serve hot.